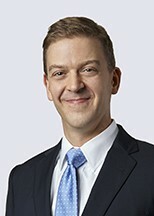 Chris Hanba is a partner in the Intellectual Property Litigation Practice Group of the Intellectual Property Department. He concentrates his practice on intellectual property related matters. He focuses his practice on patent litigation and counseling. Chris's technology experience includes work in the fields of cellular technology, semiconductors, microprocessors, DRAM and NAND flash memory architecture, computer systems, software, network technology, mobile devices, biotechnology, digital camera technology, internet technology, medical devices, automotive devices, and sensor technology, software-based medical infrastructure services. Prior to law school, he worked as a software consultant for more than seven years.